I love how this book is basically a high fantasy version of Beauty and the Beast (in almost every way) but damn if it didn't grab me by the heart. When I started this book, I thought “Why do so many people love this book?” I thought it was boring and slow and I just did not understand the hype. Until the second half of the book. The second half was so good that it made up for the first half. A Court of Thorns and Roses is a fantasy, Beauty and the Beast retelling. It follows our main character Feyre who takes care of her two sisters and their father. She’s the only one that can hunt for them, therefore she provides there food and warmth. When she’s in the woods one day she spots a deer and also a large wolf. Or is it a faerie? (Faerie’s are immortal beings who live across the wall in Prythian.) Feyre kills both the deer and the faerie and takes them home. A faerie enters their home, shortly after, blaming them for killing another Faerie and he gives Feyre the option to die now or to go and live with him in the Spring Court forever. She chooses to go with him. She realizes quickly that she’s not being kept as a slave there. In fact, it’s a much better life than the one she had with her family. The faerie that came to fetch her, Tamlin, is oddly nice and welcoming to his home and his emissary, Lucien, does not seem to like her at first. Both Tamlin and Lucien and the other faerie’s in the Spring Court all wear a mask over their faces due to the blight. As Feyre is spending her days with Lucien and Tamlin, she’s growing to enjoy her time there and warming up to Tamlin more and more. This story definitely has some elements of the Beauty and the Beast story but Sarah J. Maas, makes it her own. All the characters were great! Feyre was definitely easy to relate with and Tamlin was just wonderful. Unfortunately due to the hype of this book and the fact that it came out 2 years ago, I have seen tons of spoilers so I’m sure my love of Tamlin won’t last, but just let me have it for now! Of course, near the end of the book, I’m starting to also like Rhysand (gasp!) The writing was wonderful in this book. I see why so many people love Sarah J. Maas and the world building was maybe one of my favorite parts of this book. I can’t wait for the next one and I don’t need to recommend this book because everyone has already read it. (It seems that way) And if you haven’t, it’s ok, I’m right there with you. I’m very late to this trilogy but I’m glad I finally picked up so you definitely should too! Full review posted HERE on The Book Addict's Guide 4/1/15: 2014 was the year I became a Sarah J. Maas fan. Yes, I was a bit late to the game but I devoured the first three books in her debut Throne of Glass series and that made me even more excited for her new series releasing in the spring of 2015, A Court of Thorns and Roses. Thankfully, I got to read the first book in the series (of the same name) early. VERY early. In December, in fact, which I’m almost positive is the earliest I’ve ever read a book before it was published but I just knew I had to read it as soon as possible and I was definitely not wrong about this! 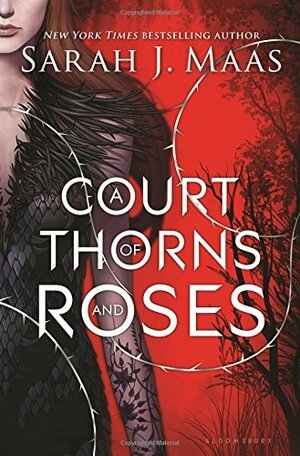 A COURT OF THORNS AND ROSES is a book you will want to read as soon as you can get your hands on it because it certainly did not disappoint! A COURT OF THORNS AND ROSES is described as “a blending of Beauty and the Beast with faerie lore” and that’s a pretty accurate description — but what I loved the most about the book is that the Beauty and the Beast hints are very subtle. There are moments that definitely reminded me of the fairy tale (and even other fairy tales as well) but ACOTAR was very much its own story. Blending is absolutely the perfect word. It’s not a retelling and I suppose it could be described as a loose adaptation or interpretation but ACOTAR is absolutely unique, thrilling, and mysterious. For those of you who have known me for a long time, you know I NEVER used to like faerie stories. In fact, I actively avoided them, convinced faeries were just one thing I would never get along with as far as my fiction went but Sarah J. Maas not only made me excited about picking up a book about fae but absolutely had me falling in love with it. I think for me, part of the reason why it stuck was that Feyre — the heroine of the book — was not fae herself. After crossing the High Fae that rule the lands to the north, she avoids punishment by death by going to live with with the Prince of the Spring Court (see the subtle Beauty and the Beast feel there?) and the readers along with Feyre discover the mysteries and politics of the fae little by little. I really feel like the human aspect really kept me linked to the story whereas if there had been no human characters and only fae, I might not have had the same reaction. The characters in this book were just phenomenal and the dynamic between each and every one of them was fantastic. Each character is so carefully crafted and it was fascinating to see just how entwined all of their stories were. I loved watching those connections unfold and how each new piece of the puzzle affected the friendships and relationships between each character and Feyre as well as amongst the rest of the cast. Each relationship is utterly unique, special, and important and these characters really just brought the book to life. The overall plot of the book was just wonderful as well. The action picked up and slowed down at just the right times. There was plenty of time for world building while we were learning about characters and even throughout action scenes. Sarah J. Maas is a master at layering plots and outlining an overall series (as I’ve learned from her Throne of Glass series which is only on book three out of six and I’m already incredibly impressed) so with what I’ve already learned from one volume of A Court of Thorns and Roses, I’m already highly anticipating what else we will get to learn and what else will be built upon the things we’ve learned from the first book. Every reveal feels perfectly timed. Every action scene feels perfectly choreographed. Every character feels utterly real. The romance aspects just made me melt and the struggle felt REAL. The forbidden romance aspect really heats things up and also brings tension levels too an all-time high. It stressed me out but also those moments where things finally fall into place — even if only for a second — give you just the best feeling in the world. I just love how Sarah’s writing grows with each book she writes and I look forward to reading every single one of her works in the future. A COURT OF THORNS AND ROSES was absolutely delightful to read (agony and all) and I’m so glad I didn’t wait as long as I had to start Throne of Glass. I won’t make that mistake any more! This book deserves all of the praise and hype that it’s getting and I think it appeals to a wide range of readers — from YA to adult, fantasy to romance — A COURT OF THORNS AND ROSES really has it all. I didn't realise this book was a retelling of "Beauty and the Beast" until I started it so I was eager to keep reading. Unfortunately, it started well but became bogged down in the middle of the story, although it did pick up once Feyre started her three trials. As a protagonist, Feyre annoyed me, doing many stupid things without considering the consequences. Tamlin was a better character but his weaknesses, thanks to the curse, had me gritting my teeth at times. I must say the romance between Feyre and Tamlin was steamy, to say the least. I was a bit shocked when I read chapter 27. It was more explicit than I expected and would have been better in a Mills & Boon novel than a YA one.